If you are a Black Friday shopper you’ll be happy to learn that the 2013 Target Black Friday Ad is now available! Target stores will be opening at 8PM on Thanksgiving night (11/28/13) and all of the deals listed below will be valid through Sunday, 12/1/13. Most of these deals are limited quantity and there will be no rain checks available. Card® when you buy any iPad mini. + Get a Free! $30 Target GiftCard® when you buy any iPhone 5s. SAMSUNG GALAXY S4 for $39.99 with With qualifying 2-year agreement. Xhilaration gloves, hats and select scarves. Men’s Hanes Bonus Packs (6+2 pk. crew T-shirts or 5+2-pk. 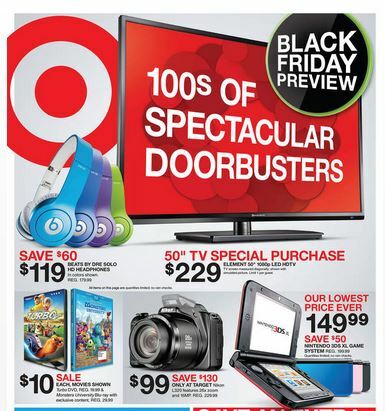 View the 2013 Target Black Friday Ad scan here.